WASHINGTON, D.C. – A Maine native is getting ready to swim with the sharks. Dr. Eric Roy, founder of the water filtration company Hydroviv, will be appearing on the ABC show “Shark Tank.” A native of Lisbon who got his bachelor’s degree from Colby College and his PhD from the University of Maine, Roy will appear on the entrepreneurial show on April 14 at 10 p.m.
Hydroviv produces customizable water filters for home or commercial use. Through analysis of water quality data drawn from sources ranging from federal to local, Hydroviv is able to determine just what the customer’s specific filtration needs might be and to optimize the filters – built to order at their Washington, D.C. facility – as necessary. Dr. Roy answered a few questions for The Maine Edge in advance of his “Shark Tank” appearance, sharing what tidbits he could while still maintaining secrecy with regards for how it all turned out (if you want to know that, you’ll have to tune in). What prompted you to audition for “Shark Tank”? What was the audition process like? Shark Tank is in the forefront of any entrepreneur's mind that makes a consumer product. Anyone who tells you otherwise is lying. If you are fortunate enough to make a deal, you have a highly visible and connected business partner that brings a wealth of experience to the table. Seriously - what else can you ask for? The audition process was hard and was far more intense than I expected. I'm not sure why I thought it would be easy, seeing as tens of thousands of people apply for the show each year and only about 100 make it on air. For me, it started by sending a “pitch” email to the email address on their website sometime last spring or summer. I was contacted by someone from casting, worked my way through the process, and eventually started working with segment producers whose job it was to try and get you in the best position to be successful on the show. Months after sending the initial pitch and working through the casting process, I was notified that I was selected to film a segment in LA at Sony's studios at the end of the summer. After you film, it's a waiting game, because you don't actually know if your segment is going to make it to air. Fast forward a few months. At around 10:30 p.m. on April Fools’ Day, I find an email in my spam folder (dated March 22) notifying me that Hydroviv's pitch segment was set to air on April 14. My team didn't know if I was pulling an April Fools’ prank on them (we take April Fools’ Day pretty seriously at Hydroviv). How did you feel about the experience of being on the show? Did you have any specific strategies or ideas about how you were going to handle things? As someone who doesn't really have any media/TV under my belt, the experience was eye opening and overwhelming. Strategically, I would say I was probably one of the less-rehearsed entrepreneurs. I went in with the attitude that I understand water quality and Hydroviv's technology better than they do, and I know my business numbers that they always ask entrepreneurs, so I was pretty confident that I wasn't going to walk in and look completely incompetent. That said, the pitch itself was more intense than I was expecting. You're standing on a carpet, with studio lighting beating down on you, about 15 feet away from five very large personalities. One thing that's not completely apparent to the viewer is that when you walk out to the carpet, they have you stand on the carpet silently for 30 seconds so they can get some footage of the staredown. The only thing that was going through my head was “This is a weird way to introduce yourself to strangers, let alone potential investors.” Once the director says “go” you go into the pitch itself, and I probably remember 5-10% of what actually happened during the pitch. I'm really looking forward to watching the episode, to see how it plays out on TV. There are a bunch of times when you have three or four of them asking questions simultaneously, which is a bit disorienting. I've been in some pretty intense business scenarios, but this one takes the cake for sure. All of that said, I'd do it again tomorrow in a heartbeat. Has it been difficult for you not to talk about how it all went? Very. I have been having stressful dreams that my dog Nano (who knew everything) learned how to talk … and that she started telling people. 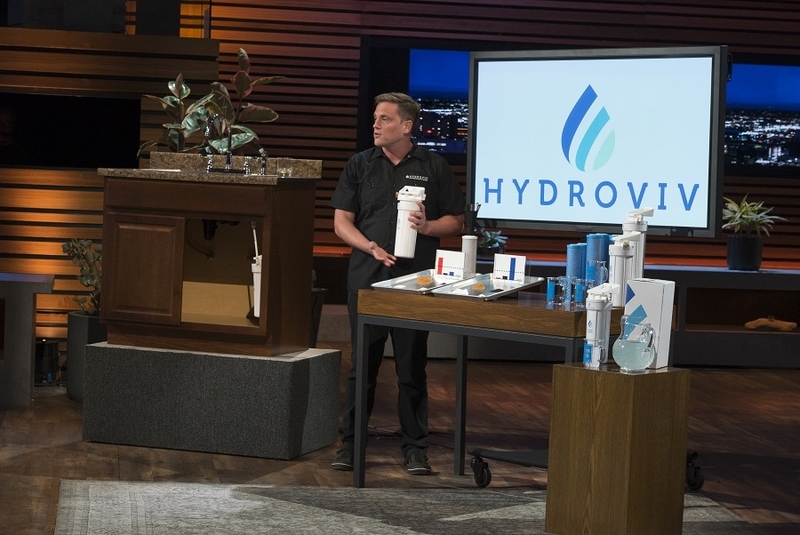 What led to you starting a company like HydroViv? Have you always leaned toward the entrepreneurial side of things? I think so. I'm very much a “Fix the problem with a smart but simple solution” kind of person. I think this mindset makes you better suited to be an entrepreneur than to work through layers of bureaucracy in a large organization.